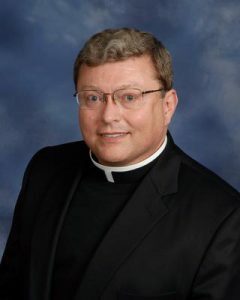 He worked for almost 30 years in diocesan administration in the Diocese of Harrisburg, PA, and the Archdiocese of Atlanta, GA, serving as Judicial Vicar and Vicar General. He studied Chemistry and Biology at Messiah College in Grantham PA, Theology at Saint Charles Borromeo Seminary in Philadelphia, Canon Law at The Catholic University of America and The Pontifical Gregorian University in Rome, and civil law at Widener University School of Law in Harrisburg PA. He is a frequent consultant to Catholic healthcare systems and dioceses, and has served on the Board of Governors of the Canon Law Society of America and the Executive Committee of the Pennsylvania Catholic Conference. He was named to “Who’s Who in International Law,” and has published numerous articles in canon law journals as well as in The Catholic Answer magazine. With expertise in matters of church governance, financial administration, and property tenure, he has given numerous presentations and workshops nationally. Apart from ministry, he is an avid private pilot and a concert organist.